Peggy the hen lives in a small house in a quiet street. One day, when she is happily following her daily routine, a strong gust of wind sweeps her up and drops her in the midst of a bustling city. Peggy takes this change of scenery in her stride and happily explores her new surroundings. Beautiful watercolour illustrations show Peggy going shopping, watching a movie, riding the escalator, and trying new food. After a while, Peggy starts growing homesick and cleverly figures out how to get home safely. Peggy the hen teaches us to embrace circumstances that might be outside our comfort zone and that a change of routine can be exciting sometimes! This book invites discussion around having a positive mindset and being resourceful in unfamiliar situations. 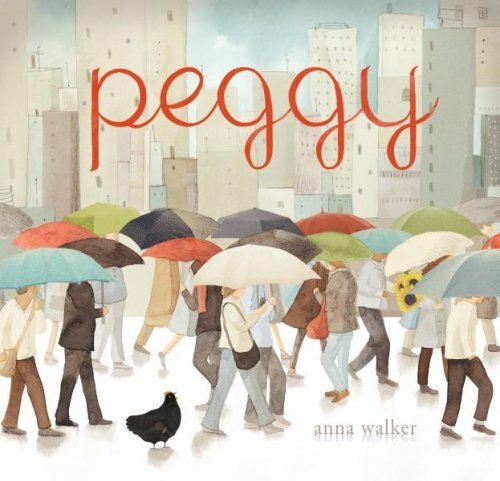 Children delight in the comical illustrations that follow Peggy’s journey. The short and simple text allows young children and weak readers to fully interact with the book and draw inferences from their observations. There is an abundance of action verbs in this book with many examples of regular and irregular past tense. This book is also a great choice for targeting higher level semantic skills, such as explaining means to a goal; explaining obstacles to an action; and drawing inferences. For further speech and language targets, see the list below.